Throughout the decades, the grandeur and excitement of Whistler has inspired a lot of couples to spend their honeymoons at our beautiful valley hideaway. Roots of Whistler’s honeymoon history date back to the 1920s when Rainbow Lodge was one of the main destination accommodations for newlyweds on the west coast. Alex Philip, proprietor of Whistler’s first lodge, would paddle honeymooners down the River of Golden Dreams in a large canoe, often by moonlight, where they could snuggle up and soak in the valley’s natural beauty. After an afternoon of skiing, the Prime Minister and his bride attended the Sunday Catholic service in the Whistler Skiers’ Chapel. 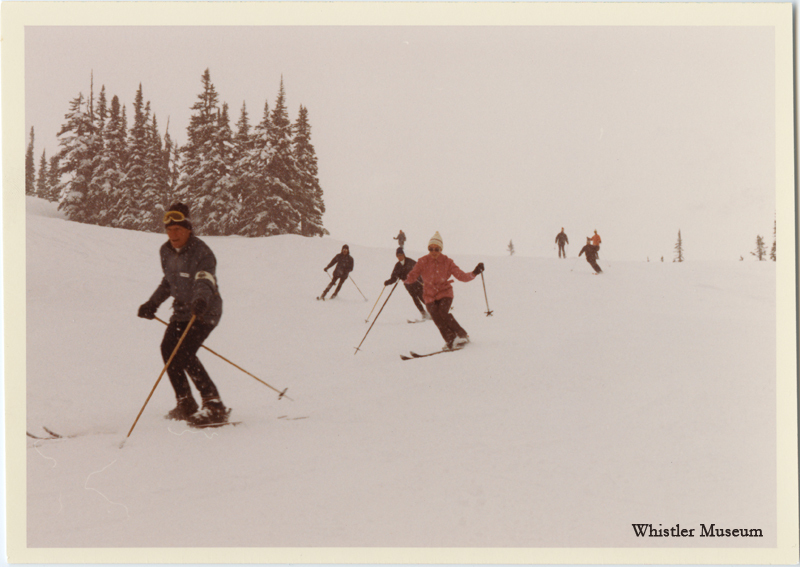 March 1971, Whistler Mountain collection. 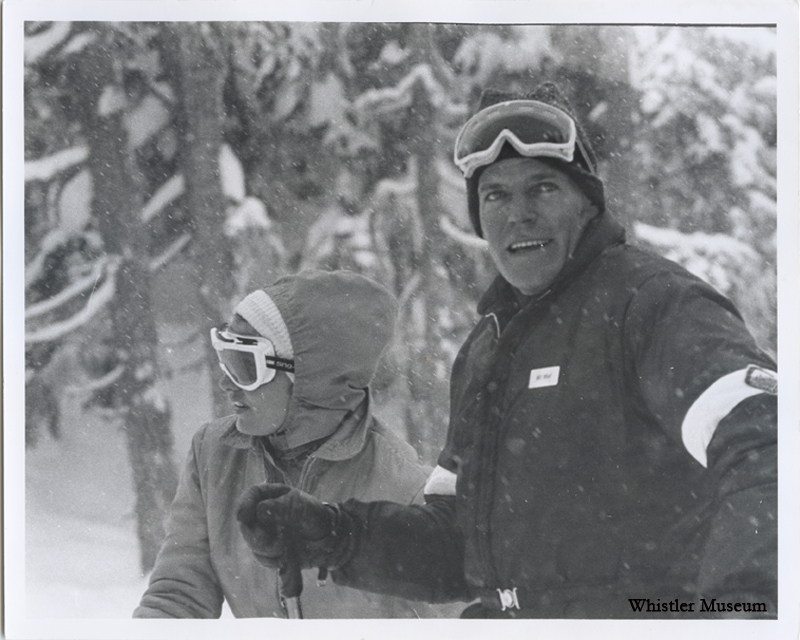 The most famous honeymooners in Whistler are undoubtedly former Prime Minister Pierre Trudeau and his bride, Margaret. Pierre Trudeau was a 48-year-old bachelor when he became the Prime Minister of Canada in 1968. In March 1971, the hearts of many Canadian women were broken upon the announcement that Trudeau had married 22-year-old ‘flower child’ Margaret Sinclair. They surprised the media with their secret wedding in Vancouver, and afterwards drove directly to Whistler for a three day stay. 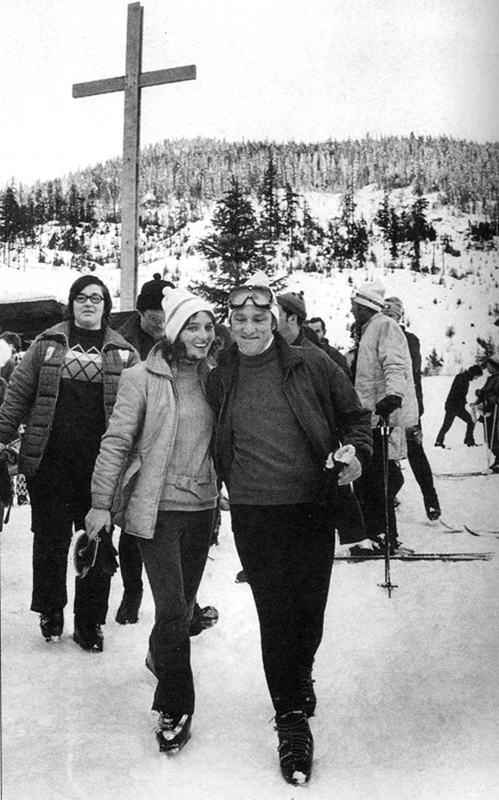 Here, the newlyweds took a skiing honeymoon, media in tow, with everyone excited about the refreshing hipness of Canada’s First Couple. Clearly, such esteemed guests required ‘above-and-beyond’ service. So, Jack Bright, General Manager of Whistler Mountain, and Jim McConkey, Whistler’s prominent ski school director, served as the newlyweds’ personal ski instructors during their stay. Looks like, when it comes to fairy tales, our enchanted Whistler is the right place to be. This entry was posted in Ski-Town stories and tagged British Columbia, honeymoon, Trudeau, Whistler. Bookmark the permalink.